Trial Skills for the Employment Lawyer. I’m a member of the California Employment Lawyers Association. Recently, a local Orange County group gathered recently for dinner and discussion. File defamation cases. Malice is inherent in a retaliation case. Tell your client’s heroic story. Persevere in finding your witnesses. Tell the jury: Don’t compromise your verdict: damages and liability are separate. You must win the “verdict form” battle. Instructions and findings matter. Go for punitives. They are leverage. 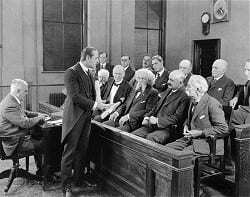 Juries care about jury instructions, sometimes getting overfocused on a few words. It’s wise to tell them to use their common sense. You want to be a better trial lawyer? Try more cases. It’s the only way to learn.